Some of the investigated services include Haasonline, Cryptotrader, Gekko, TradingView and more. Each of these services has its own properties that you should check out, as they provide advantages for Bitcoin trading, Ripple trading and other cryptocurrencies. Crypto software tools make trading more manageable and provide additional features to potentially increase your profit. Many tools are available, but you should only choose the reliable ones. We present some trading tools to keep track of all your trades among different exchanges and will help you with your crypto trading taxes. Cointracking is a very powerful crypto trading software with 370.000 active users and will provide all features you need for your crypto trading. BitcoinTaxes is a more focused crypto trading software towards only tax reporting including following services. Import trade history, spending, income and mining. Read more about these crypto trading software and how to pay tax on crypto trading. If you prefer someone else to do trading in your name, why not consider letting an algorithm do that? Trading bots are nothing but codes that perform automatic trades on your behalf. They can increase your earnings while you are sleeping, but they can also cause losses. More than 10,000 customers are using Haasonline Trade Server. The software allows you to use trading bots (HaasBots) and offers access to insurances, safeties, and technical indicators. You can also auto-tune settings depending on the time of the day or the month. The number of available features to use depends on the plan you select. You can choose between Beginner, Simple, and Advanced plans. Keep in mind that Haasonline is a pricey service, so think twice whether you need it. If you are an experienced trader, you can significantly increase your earnings. You can check out these plans in picture below. You do not have to install the software on your PC. Instead, Cryptotrader runs on the company’s cloud-based servers. 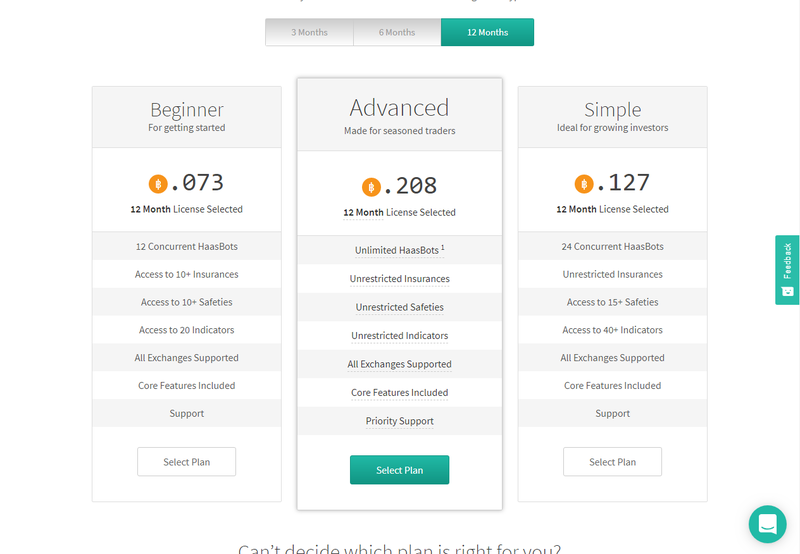 You can choose from five different plans. More money invested means more trading bots available, as well as extra features such as margin trading and SMS alerts. Cryptotrader includes simulation of various market conditions based on historical data. That way you can test different strategies until you find an appropriate one. Alternatively, you can head to the marketplace and buy a successful strategy from a fellow investor. Gekko is a crypto trading bot available free of charge. It is open source and you can install it on OSX, Linux, or Windows. It is an open-source project and everyone can access the code via Github. It does offer backtesting, but this is in no way an advanced tool. Gekko is ideal for those who want to gradually enter the world of automated crypto trading. Charts provide precise information about price fluctuations of a certain currency over a specific time period. It is an essential tool for all traders and those in the crypto community are not an exception. You might have heard of Trading View if you were ever traded currencies, futures, or bonds. The website keeps up with the technology and they included crypto coins in their monitoring. They offer simple charts for four cryptocurrencies, including Ripple, Bitcoin, Bitcoin Cash, and Ethereum. Trading View does not offer advanced charts, but that means the beginners can easily read them. You can check out the platform in snapshot below. CryptoWatch is another service you can use to monitor prices of various currencies across various digital exchanges. The homepage offers an overview of all supported coins. You can also use the menu to select the desired exchanges, assets, or quotes. The website offers detailed charts and delivers all relevant information you might need. Newbies might have a bit of trouble reading the charts. Exchanges offer various prices for the same crypto coin. That is where CoinMarketCap comes extremely handy. It takes these rates and calculates an average price. Aside from that, it also provides information about the last 24h trade volume and the available supply of currencies. The website supports over 1,000 currencies and also offers global and historical charts. You cannot monitor dozens of exchanges at the same time. API is the tool that makes this possible. In short, API (Application Programming Interface) interacts with digital exchanges and collects useful data, such as prices and trade volumes. Most trading platforms offer APIs. API is used to link a crypto trading bot or a crypto trading software with a crypto trading platform. In the crypto trading platform you give permissions to the API. Some examples with API are BitMEX, Bitfinex, Binance and many more. At this moment, CoinAPI integrated over 80 exchanges and 1700 assets. Real-time market data updates are available 24/7 so that you do not miss any relevant information for a successful trade. The free version allows you 100 requests every day, but two premium pricing plans increase that number and bring several extra features. In this crypto trading tools guide, we went over the market’s tools that make trading quite exciting, especially for starters. It is evident that since 2009, cryptos have went long road in developing necessary trading tools. Many functions are available for beginners to use, though we do stress the importance of participation. Without your own involvement, these tools might drive your margin into a loss, rather than a profit. Other helpful tools can be crypto social trading, crypto trading bots and pay tax on crypto trading software. Dont forget to read through our Best Bitcoin Social Trading article with the latest updates.